Having earlier enjoyed the Lonely Planet recommendation of Houng Lai Restaurant for the days lunch, Mike and Melissa were eager to check out another Ho Chi Minh City dining option. Sozo Cafe was described as a place to get doughy cinnamon rolls while once again serving disadvantaged families from the area. Knowing that they'd be setting out early the next morning for a Mekong River Tour, the Harrington duo decided that a late night iced choco and bubble tea were just the thing to end a good day, not to mention a doughy, homemade cinnamon roll would make the morning bus trip that much sweeter and easier to handle. 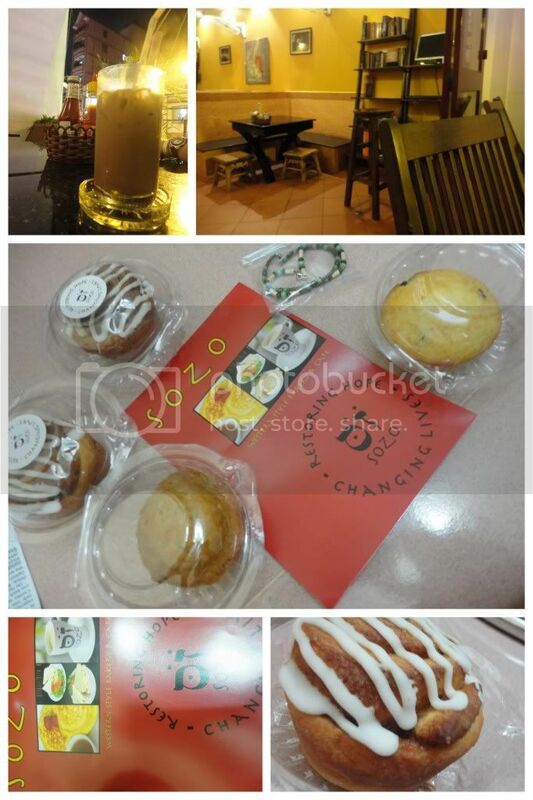 Quite near their hotel and in the heart of the backpacker's quarter, Pham Ngu Lao on the main street Bui Vien, Sozo Cafe can be found with an inviting case of muffins, brownies, cinnamon rolls, cookies and much more. Interestingly, when reading through the menu at Sozo cafe, one quickly learns that the cafe started as nothing more than a street-cart offering home-made cookies to foreigners and has now blossomed into a multi-story cafe with more than just cookies! In addition to the sweet treats and coffee drinks, Sozo offers a few handmade braclets, necklaces and earrings made by another set of Vietnamese people, most of whom are blind or disabled. A great way to pick up some gifts or souvenirs and make sure you're giving back to the community.